A young lady has cried out on social media after she discovered that her boyfriend had gotten married to an unknown woman. The lady narrated that she had no idea he was in a relationship with someone else or even the fact that he planned to tie the knot. 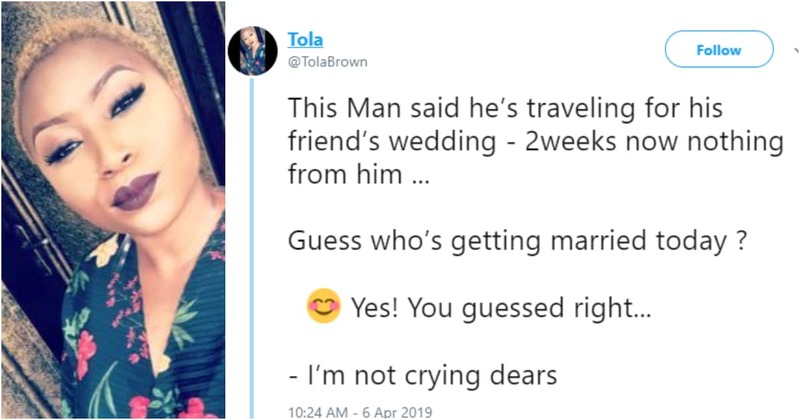 The lady identified as Tola Brown shared the heartbreaking story on her Twitter account. She explained that her boyfriend her lied to her that he was travelling to Akure for a friend’s wedding. Brown had expressed that she is heartbroken and does not know how to feel or what to do about what she discovered. Guess who’s getting married today ? I’m i still supposed to confront him ? According to the lady who shared a series of tweet, she had been worrying about the man in Lagos while he was saying I do to someone else in Akure. Ori mi ti fa la si meji !!! Mo break celibacy fun boboyii oo !! I did i miss this ! Just how ?